After the financial nightmares of problems with the three most important tools for my job (camera, car and computer) I was relieved to pack the car, now working like new again, thanks to a new turbo, tyres and brakes, and drive north to Oban. 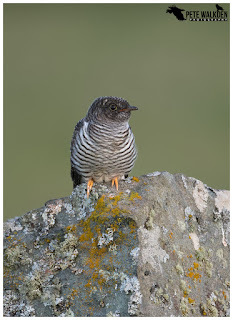 The Mull Photography Tours were still a fortnight away, so what was I doing there so early? Andy Howard, who I co-run the summer tours with, had arranged a bespoke tour with some clients, to see wildlife in the Highlands, and then on the Isle Of Mull, and he'd asked if I could lend a hand, splitting his group in half, hence making guiding a little easier. 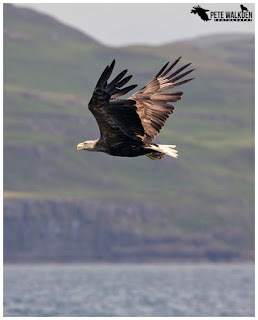 I wasn't going to pass on an opportunity to visit Mull, so met up with him and his four clients late afternoon. 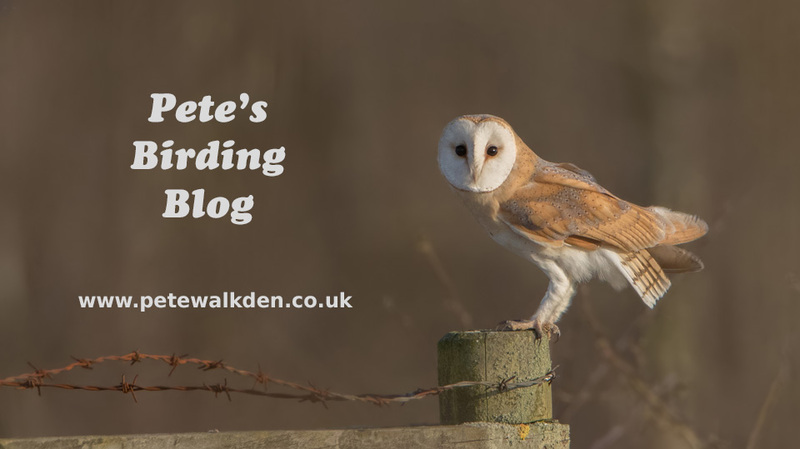 By then, I had already spent a couple of hours watching hen harriers hunting over some marshes, and a ringed plover scuttling busily about on a shingle shore. 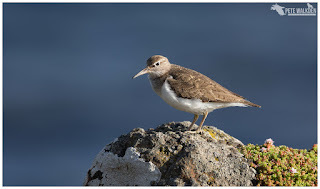 My clients wanted to capture images of otters, though they were also happy to see what else Mull had to offer, so while looking for otters, we enjoyed the sights of some of the more common birds, such as oystercatchers with their young, and common sandpipers watching over their offspring from lofty spots, such as rocks and roadside posts, plus special moments with hen harriers, short-eared owls and a golden eagle. The second day of the tour involved a private trip with Mull Charters, which is never a bad thing in my book. 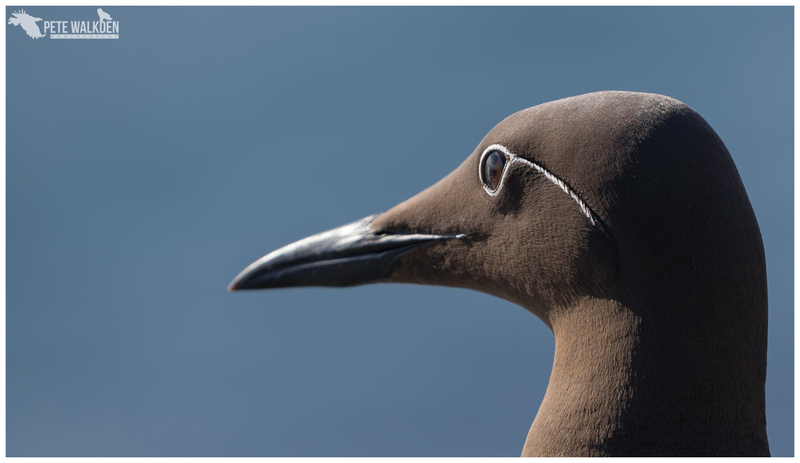 It was sunny and relatively calm on the water, so with the extra space to move around on the boat, I used both my 500mm prime lens, and my new 100-400mm mk2. 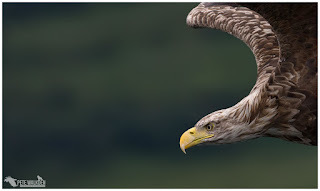 The latter is so impressive, and offers the chance to compose shots using the zoom, while easily handling it, tracking the eagles. Something nigh on impossible to do with the heavier prime lens. And we enjoyed several visits from the eagles, something that has become almost the norm for this trip of late, which must be a real blessing for Martin and Alex who run it. Bespoke tour over, and rather than drive south, I followed Andy back to the Highlands for a week off. And with Andy also not working for a few days, we could enjoy some of the local wildlife together. 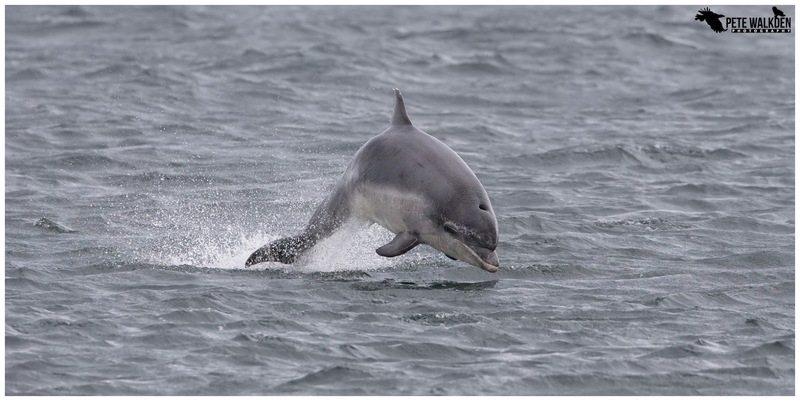 First stop was Chanonry Point, where we watched some bottlenose dolphins chase down salmon as the tide rose, with the occasional breach to entertain the crowds standing enthralled on the beach. I love this spot - to be able to stand and see these normally elusive mammals at such close quarters is incredible really. 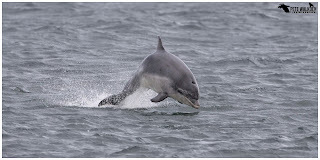 Though capturing them as they break free of the water is still tricky! As a thank you to me for helping with the Mull guiding, Andy had arranged a morning's session down at Rothiemurchus Estate for the ospreys. It meant a very early start, and being in the hide at dawn. Now I have been to this site before, though many years ago, and it has changed significantly since then. 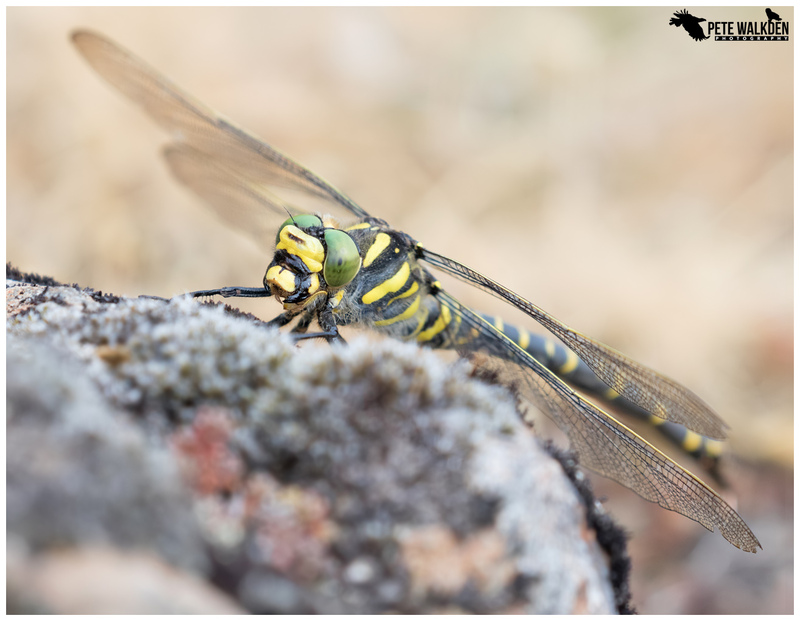 Instead of being in a hide beside the main lake, the photographers now view a small pool, from hides sunken into the ground, giving water-level views. As before there's a spotter employed by the estate, to give the photographer some sort of advance warning of when an osprey is circling or diving. What hadn't changed was the wait for something to happen. It was hours before we heard the radio crackle into life, informing us of a bird circling, and then saw the shadow of it over the trees nearby. 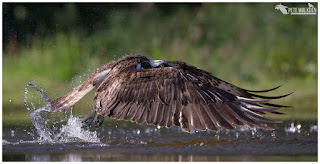 Then it was the excitement and tension before we heard one was diving, and after that it was a case of getting the camera focused on the osprey, and attempting to maintain a focus lock as it lifted out of the water, to fly away. Not as easy as you'd think, with all the spray of water from the wings, but wonderful to watch regardless. 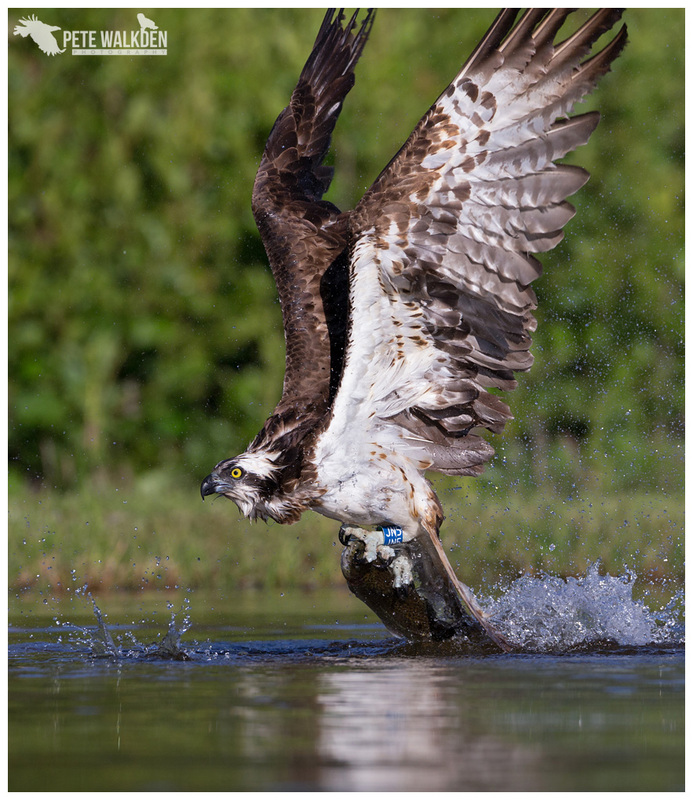 We were fortunate to see at least nine dives by various ospreys during the session, and came away with some great images, in bright sunny conditions. I think I may need to revisit this estate again in the future, as it was an awesome experience. 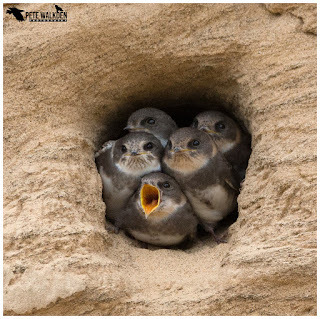 The remainder of my time in the Highlands saw me observing a local sand martin colony from close quarters, attempting to capture images of the nestlings about to fledge, some of them doing so accidentally when the sand gave way below them and they fell out of the nest area! 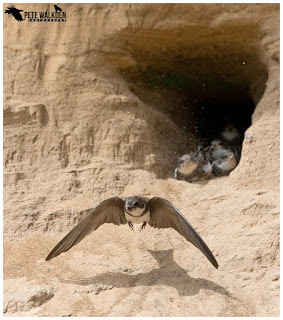 Plus some shots of the adults flying to and from the burrows, which involved a certain amount of timing and luck in equal measures. 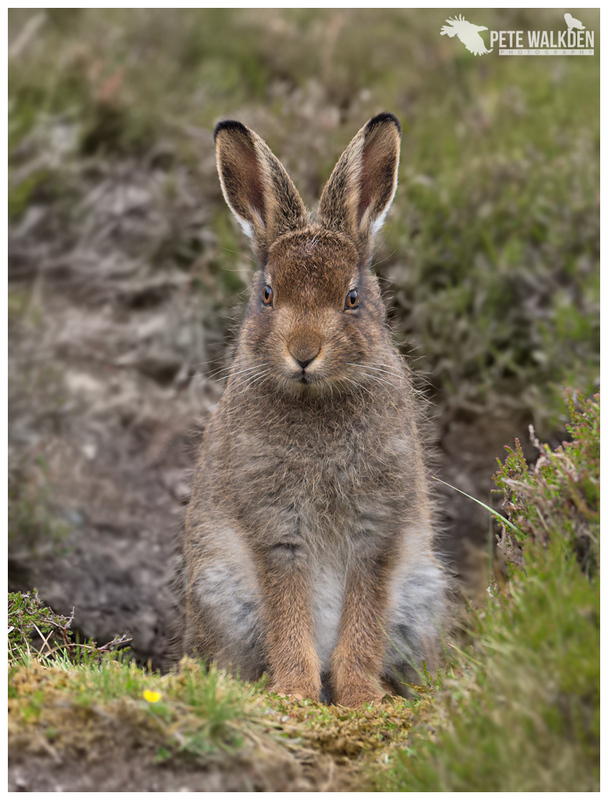 A trip up the hills one afternoon resulted in a charming encounter with a pair of mountain hare leverets. 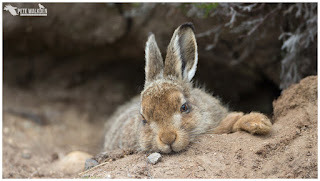 Initially they vanished under the heather as I approached, but after I waited a while silently, they crept back out, and I watched one snooze in the warm weather, and then both grazed on the vegetation around me, even nibbling on a daisy! 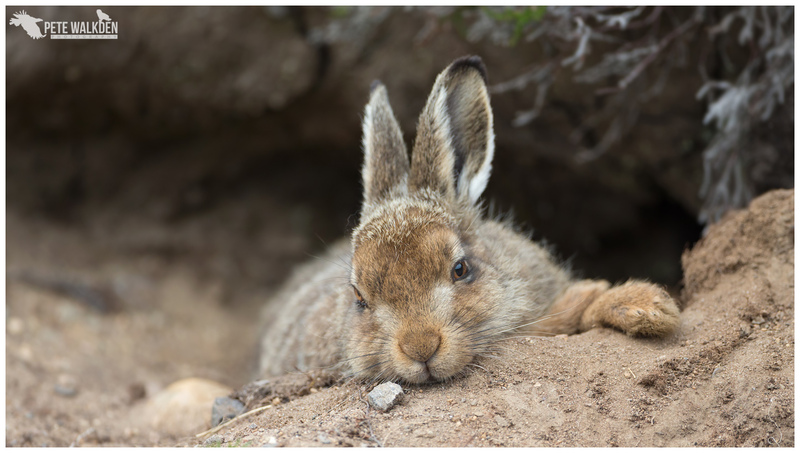 They really are utterly adorable little animals. The week flew by and towards the end of it, our attention turned to the Mull Summer Photography Tours. This summer saw us running three, back-to-back. Based in the same farmhouse as before, we didn't take long to settle in, once all the contents of the two cars were unloaded. We had just a couple of hours free on the Saturday night before getting some sleep, and welcoming our first clients to the house, on the Sunday. Now I could detail what happened on each day of each of the three tours, but this blog would perhaps rival War And Peace in terms of length, so I'll try to compress the action somewhat. Without doubt, Andy and I agreed that the highlight of each of the tours were the sailings on the Lady Jayne with Mull Charters, for the white-tailed eagles. For next year's tours, we are changing the itinery so that the public trip we did this summer, is replaced by another private charter, so our clients get two private sessions on the boat. 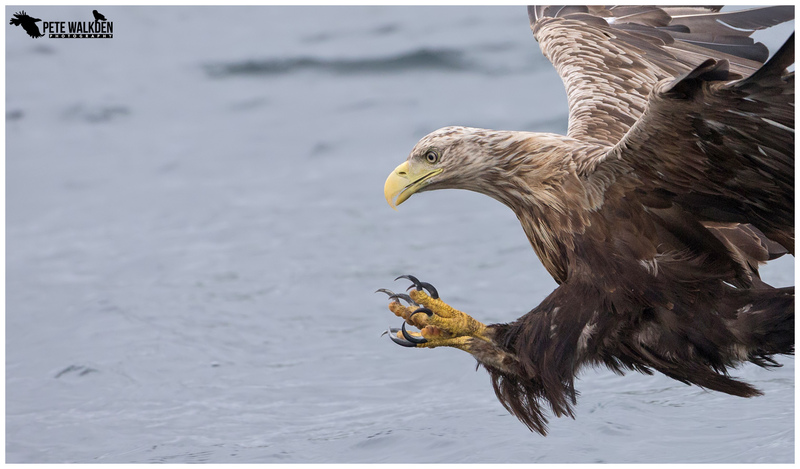 With advice and preparation before the eagles arrived, we ensured our clients had their cameras with the right settings dialled in, and everyone managed to capture some cracking images of the eagles diving beside the boat. 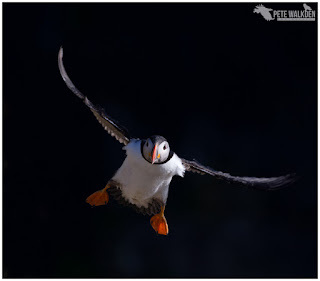 Personally, I varied the lenses with each dive, sometimes favouring the flexibility of the 100-400mm mk2, but occasionally trying the 500mm, and even that with the 1.4TC attached. That combo was a little tight in terms of getting the eagle in the shot. The waters around Mull were unusually warm, and this perhaps had led to the arrival of huge blooms of jellyfish. These at times numbered in their thousands, and from a distance turned the colour of the water pink. Alex dipped his Go-Pro camera in amongst them to record a fascinating video - almost star-field-like. Hypnotic even. And we were fortunate on one trip to encounter a pod of bottlenose dolphins, which entertained our clients and provided additional photo opportunities. 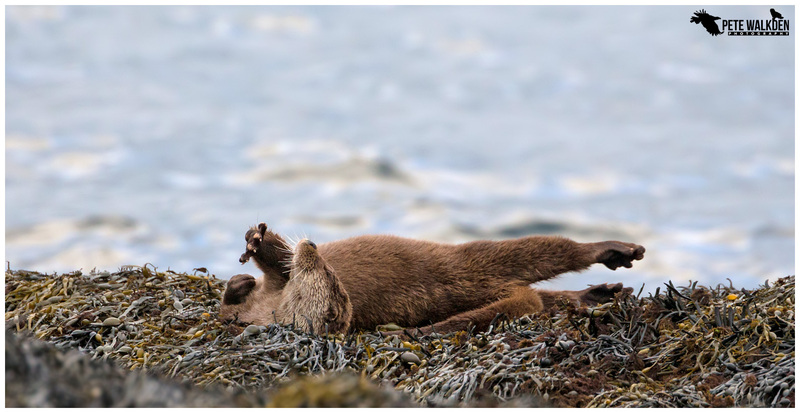 The downside to the warmer water was the effect it had on the local otters. 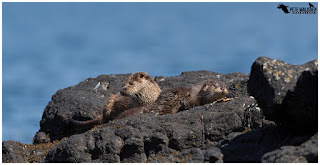 We guessed that because the shallower parts of the lochs were warmer, the food the otters normally caught had moved out into deeper, cooler water, and that meant the otters swam further out, and generally stayed out, eating prey while they swam. Not great for us as guides to get clients close enough to for images. Also, with the hot conditions, the otters were favouring night-time hunting to stay a bit cooler. 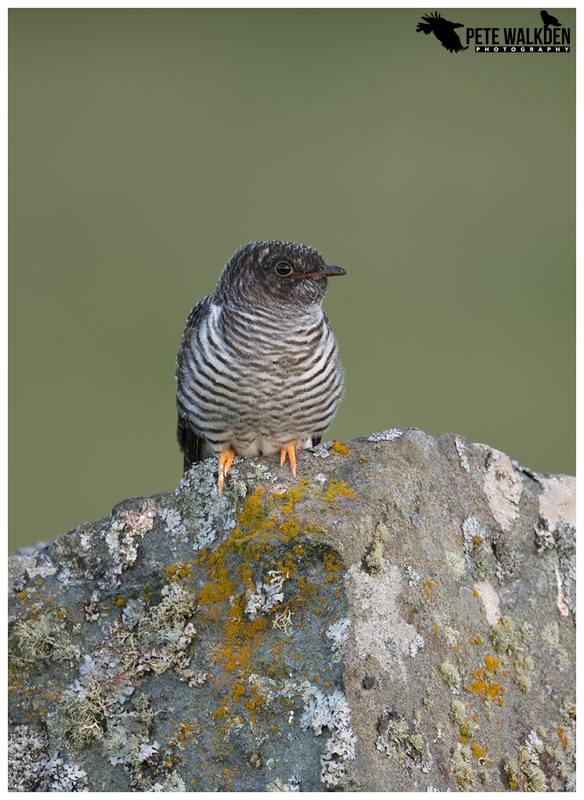 And when we did get an individual behaving more like we're used to, heat haze from the rocks was a problem, resulting in soft images. But we refused to give up, and took to dawn starts to search for these mammals, or looking just before dusk. 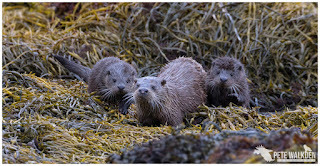 And as a result of our determination, we managed to get all of our clients some images of otters. I have to make a special mention to two of the clients during the second week, who showed tremendous generosity to back away from an otter opportunity, to allow the other three clients the chance to bag some images for themselves. With images of otters already in the bag, it was something Andy and I had discussed should the situation arise, thus ensuring everyone left with something. 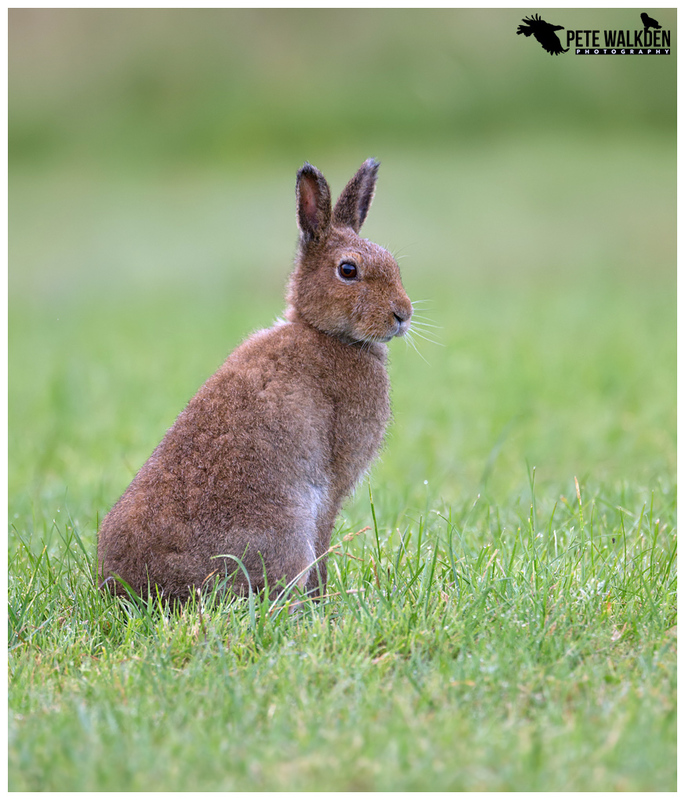 Whilst Andy was searching for an otter, I spotted one close to me and my clients for the day. I asked my clients if they minded giving up the opportunity to Andy's group, so they could get some shots, and they kindly agreed. 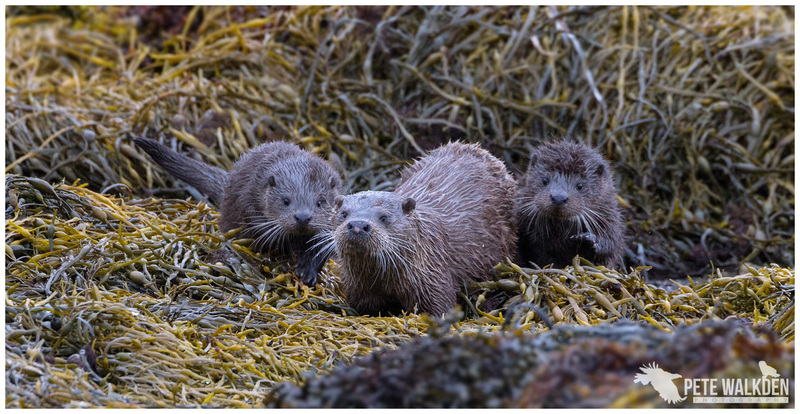 After managing to get Andy's attention and not spook the otter, I was very relieved to watch from afar, as he guided the group in to capture images of the otter as it rolled around on seaweed. The other "banker" each week, provided the weather was ok (which it was every week this year) was the Turus Mara sailing to Staffa, and then on to Lunga. 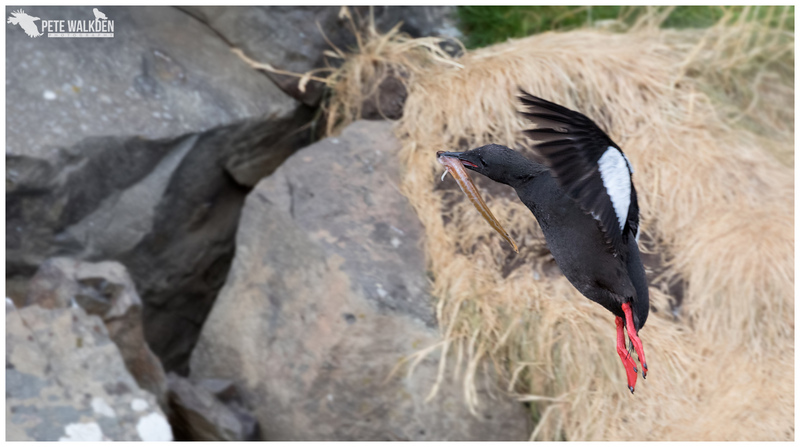 We used the Staffa stop off mainly for a picnic spot, though on one of the weeks we crouched beside the steps leading up the cliff-face, to photograph some black guillemots nesting nearby. But Lunga was the place to be, with its huge colony of seabirds. Puffins galore along the first stretch of cliffs, with a more treats of guillemots, razorbills, kittiwakes, shags and more puffins further around the coastal path. 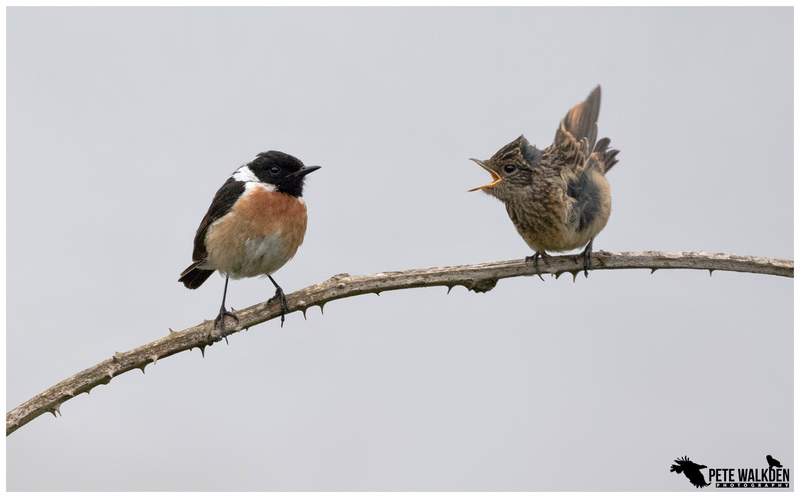 With several hours beyond that of the normal public trip to hand, we offered advice when needed to enable the clients to take images of the birds, with some images pre-planned and executed with a bit of patience, and others gained by reacting to what was on offer. Using different light and backgrounds, subjects being close or further off, stationary or moving, we were able to suggest numerous ideas for images throughout the day. 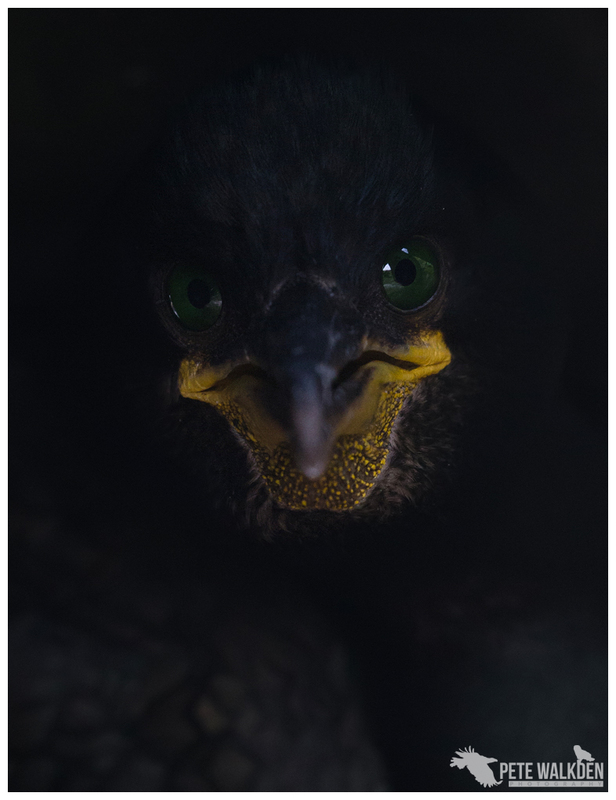 While the puffins are undoubtedly the crowd's favourite subject, I chose to focus on other birds, particularly the enigmatic shags, that hide away in dark crevices (to avoid overheating), but hiss should you stray too close. 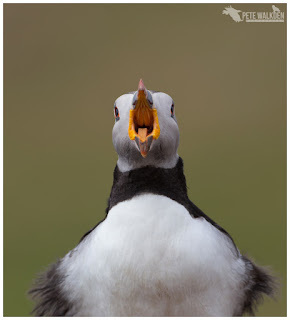 And grabbed opportunities with guillemots, especially a bridled one that was perched on the cliff-top, close by. 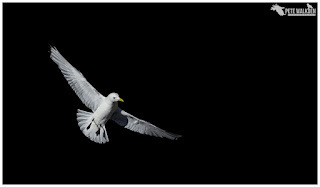 The bright, white of the kittiwakes made for a contrasting sight against the darkness of the deep channels below too. 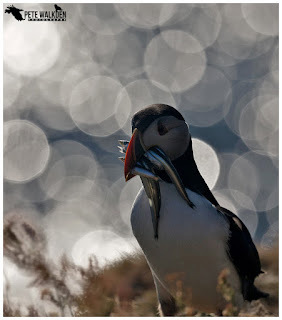 One day perhaps I will get the chance to stay later on the island, to see sunset and sunrise, but during these weeks, we left at around 8pm, and were whisked back on a speedy boat, courtesy of Iain and Sharon from Turus Mara. 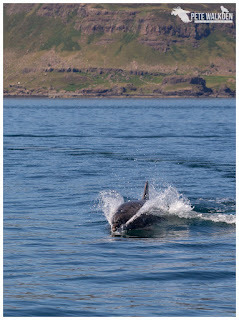 I always enjoy these days out on the islands, with the wildlife but also the stunning vistas all around. Magical place to be in the summer months. 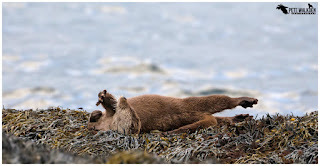 Our primary species of otters, white-tailed eagles and puffins were all ticked off, but of course Mull has a lot more to offer on top. 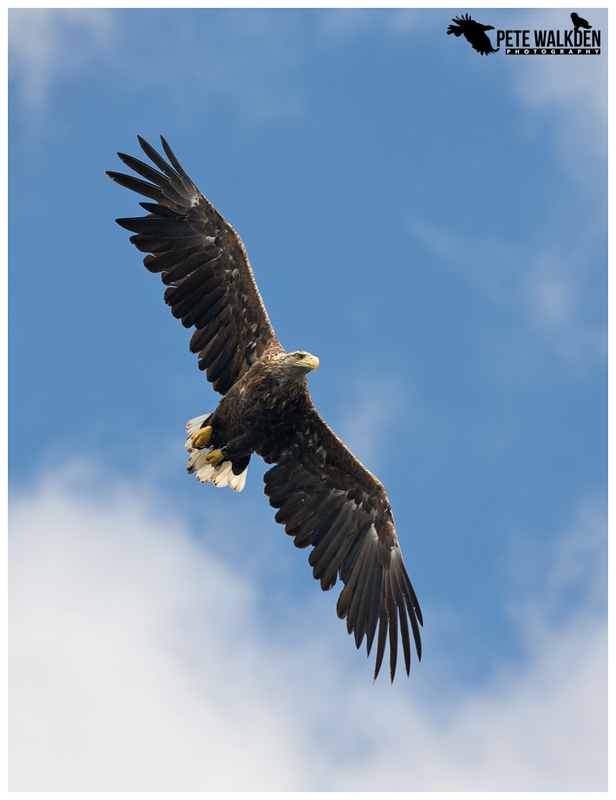 We frequently saw golden eagles, though never particularly close. 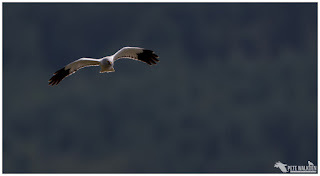 Hen harriers remained hard targets, typically turning tail as soon as a camera was raised. 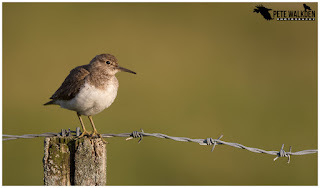 But opportunities to photograph birds such as common sandpipers, pipits, swallows and even juvenile cuckoos were gratefully accepted. And seeing as the Hare Whisperer himself was present, we used Andy's skills to get some of us close one morning, to a trio of Irish mountain hares. It wasn't the closest encounter though. 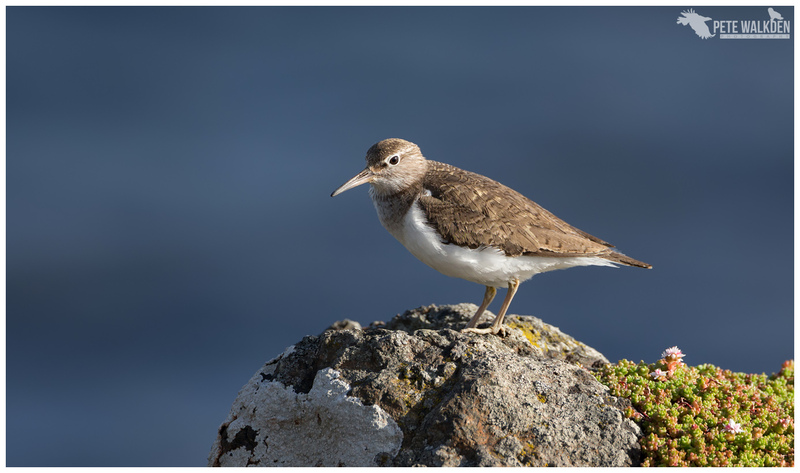 I had one scamper out in front of me on a beach, as I scanned the rocks for an otter I had "misplaced". Sadly I was carrying only my binoculars, so such images remain only as memories. Between the tours, Andy and I had just half a day to chill out, before preparing for the next one. 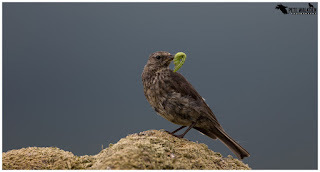 And we used this time after the first tour to visit his family's home on the island, strolling along the cliffs amongst the bracken, watching stonechats, pipits and whinchats, crouching close to the ground to watch a distant golden eagle soar over the higher ground, staying low to capture images of a dragonfly sunbathing, and taking in the incredible views. We even spotted the Lady Jayne sailing out into the sea, and watched a pair of white-tailed eagles fly to meet her, from well over a mile away. The speed they covered the distance at was phenomenal. It is a sight like this that tends to stay with me in memory for years. Something a bit different; impossible to photograph, just there to be enjoyed and inspired by. The final, third week was unusual in that for once, the unsung hero of the tours, Andy's wife Lyndsey, was joining us. Not just to help with the cooking, but to experience the joys of the tour for herself. 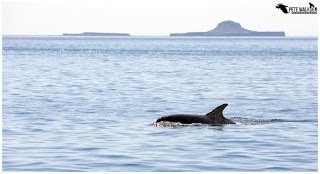 Having visited Mull several times before, she was familiar with most of it, but had never visited Lunga, Staffa, or sailed aboard the Lady Jayne. She wasn't disappointed. While she chose not to join us for the otter days (having already obtained many images from previous visits, and bagged the Scottish Nature Photography Competition Behaviour Category with a stunning image recently), she did tag along on others, enjoying the antics of the puffins on Lunga, the eagles around the boat, and even some of the smaller residents, like stonechats and goldfinches feeding near the roads. In the blink of an eye, the three weeks were over, we were all gathering up bits and bobs from the accommodation, and then heading north again, in convoy. Not for wildlife this time, though we did watch the dolphins again while I was in the Highlands, but to help celebrate a friend's birthday. Then it was time for the long drive south, and the task of sorting out several thousand images. The three tours had been a massive success, although tiring for us as guides. 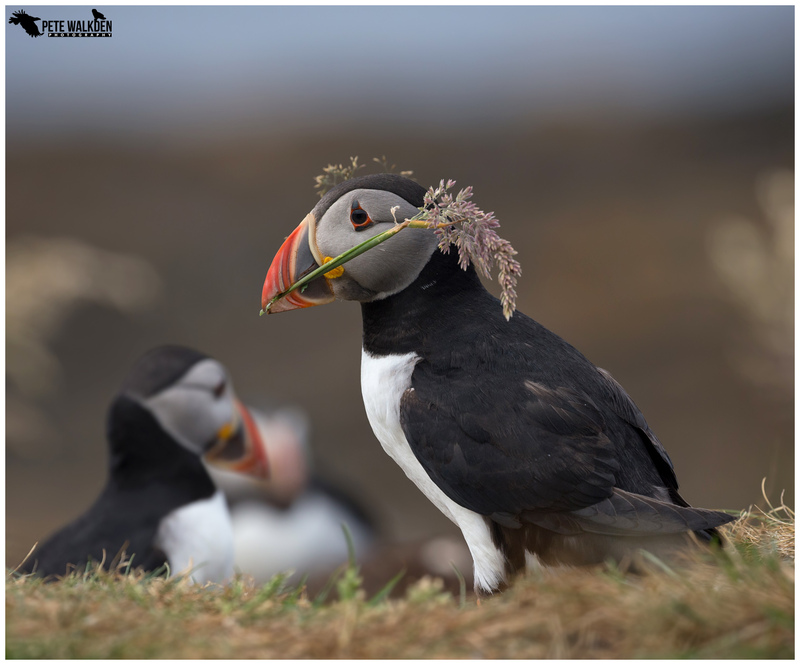 The images obtained by our clients spoke volumes for what the tours can provide, and before we'd even left Mull, the places for 2019's three tours had already been filled.